Intrigued? You should be. Trollhalla is full of whimsy, humor and interesting, intuitive mechanics. 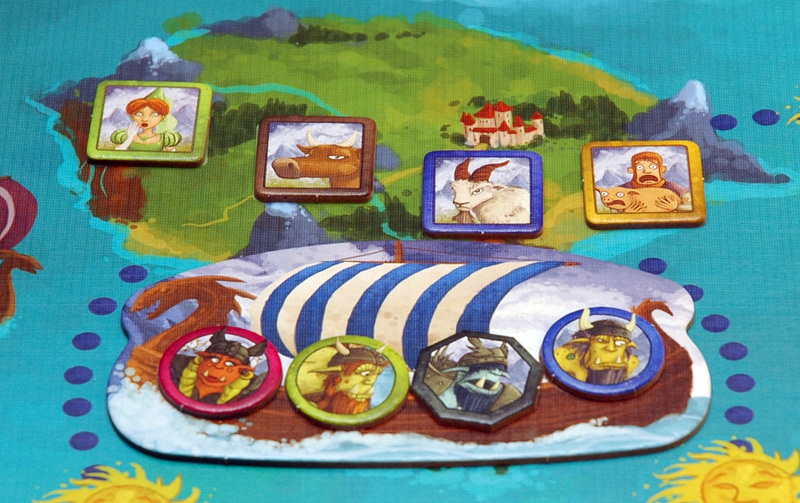 The overall goal of the game is to get your trolls into the best seats on three ships that sail to various islands. Once the ship lands, your trolls can plunder the goodies on shore. However, each troll can only plunder the goodies that are lined up with their seats on the boat – it’s part of troll code, don’t you know. This basic bit of troll code drives the core of the game, as every player will spend much of the game jockeying for the best positions on each boat. 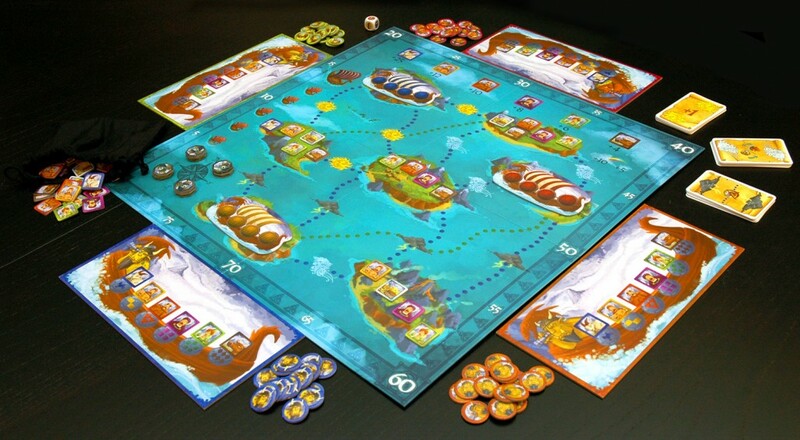 Each turn, a player places two of their trolls on boats or on a weather space at sea (collecting a matching weather card). However, trolls of the same color cannot be next to each other in a boat or weather space lest they squabble. Such is the temperament of trolls. When all trolls are placed, the player rolls a die to randomly select one of the three boats. If the boat is full of trolls, it sets sail to maraud and plunder. If the boat is not yet full, a Chief Troll takes a seat. When a boat is full and sets sail, it plots a course to an open island at the end of whichever route has the most trolls stacked on the matching weather space. If routes are tied, the trolls get all confused and the boat doesn’t set sail just yet. Weather spaces serve another valuable purpose. Remember those cards a troll gets when placed at sea? Pairs of these cards can be traded in to get a special action, and these can be the real gamebreakers – and a real thorn in an opponent’s side – if used wisely. An intriguing combo that can really shake up the game is trading two Wind cards to “flip” any boat or stack of trolls on a weather space. The boat flip can help a player put their troll into a position to get the best plunder on an island. Flipping a stack of trolls on a weather space is also handy, but we’ll need to take a look at another feature of the game in order to understand why. Using Wind cards to flip some stacks. In both of these flips, blue troll is getting the fuzzy end of the lollipop... unless he likes petting zoos. You see, when a boat sets sail, all trolls on the weather space along its route are removed and placed, in order, in tiny boats behind the chief troll’s boat. This boat contains loot and plunder that any chief trolls on board ships claim when a boat lands at an island. The player with the most trolls in these ships gets first choice of one of the plunder tiles on the chief’s ship. In case of ties, the player with a troll in the boat closest to the chief’s ship gets first dibs. This is why one flip of a stack of weather trolls can be the difference between plundering a delicious cow and getting a grumpy old billy goat. Speaking of billy goats and plunder tiles, each tile is worth a set amount of points, and the player with the most tiles in a set at the end of the game also scores bonus points. And remember those billy goats? Well, whenever a troll plunders a billy goat and puts it on his personal ship, the goat gets really grumpy and boots one of the other bits of plunder overboard. Yeah, they’re a real pain in the troll tuckus. However, if any troll is brave enough to collect a set of billy goats, they can start a petting zoo and get a whopping bonus at game’s end. It’s like shooting the moon in Hearts, and it adds a nice touch of unpredictability that can break a game wide open. 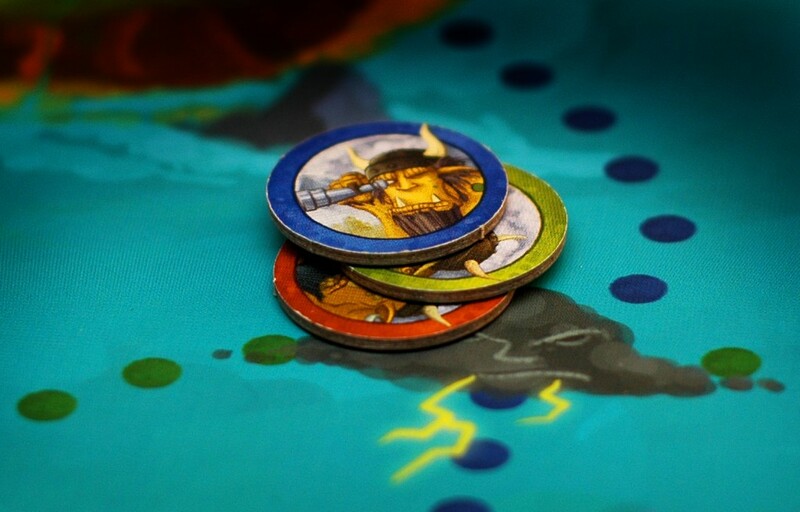 Trollhalla is a very light-hearted and enjoyable game that deftly mixes strategy and luck. 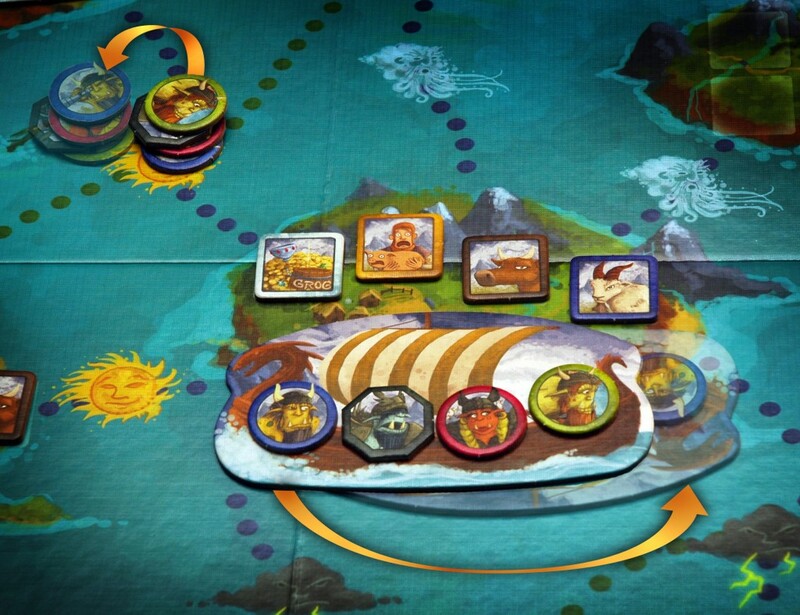 Although there are limited seats on board the three boats, wise players are able to minimize missing the ride with judicious placement of weather trolls. It may seem as though there’s a lot to keep track of in Trollhalla, but play is quick and lively since players only place two trolls on most turns. Score is tallied at the end of the game (when there are not enough plunder tiles in the goody bag to seed an empty island), so unless you’re playing an accountant or Rain Man, every player will feel as though they’re in it to win it until the very last Pig Boy is plundered. Overall, gameplay is smooth and rewarding. Strategy level is fairly high, but there were some instances of players Forrest-Gumping their way blindly onto the best spots on boats, resulting in big wins. Much of this was in early plays, though, and we soon found a way to minimize a lot of the luck factor. Despite the limited board and actions, even after several plays Trollhalla feels fresh. Replay is aided quite a bit by variant rules and the inclusion of weather tiles that can be used to randomize the static weather spaces. This game is primed for house rules to equalize things; within the first couple of plays, we were already talking about bumping up the number of billy goats needed to start a petting zoo. Trollhalla’s theme is delightful, and the wonderful art by Ryan Laukat brilliantly punctuates the offbeat quirkiness of Viking trolls. From the expressions on Pig Boy and Dr. Phil’s faces, to the gruff glare of Grumpy Goat, the game exudes humor and joy. The components are top-notch, with a sturdy, textured board and thick plunder tiles and troll tokens. The only drawback to the components is the boat die - a blank white die is supplied, and colored boat stickers must be applied. 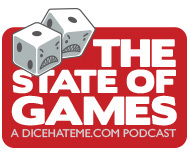 The decision to make the die this way makes financial sense, but in fairness to my ratings system, I can’t give a perfect score when not everything in the box is of the same high level of quality. Yes, Trollhalla is awesomely fun. The smooth play, riotous theme and storybook art all combine effortlessly to provide an engaging and whimsical gaming session. Although the weather cards can add a little bit of punk factor to the proceedings, even when your boat is flipped and you end up getting kicked in the Mjolnir by a goat rather than sipping grog with the Valkyries, your first reaction is likely just to laugh, shrug, and, of course, plot some good-natured revenge. Overall score: 16 out of 18 - There's nothing gruff about this game. Plunder it immediately! Trollhalla is a game for 2 to 4 nordic goat-herders, ages 8 and up, by Alf Seegert for Z-Man Games. It retails for $32 from Funagain Games, or pick it up at your favorite local game store. Please bring this to work! These pieces remind me of POGs and I’ve always had a fondness for trolls. Seriously misunderstood, I’d say. I can already see great potential for “houseboat” rules in our lunchgame crew. Sally – Of course I’ll bring it to work! I think you and Christine will love it. Dan… well, that remains to be seen.